The transalpine bank BSI Bank underlines its international spirit in the promotion of contemporary art and partnerships with important Italian institutions. BSI Bank of Italian Switzerland, founded in Lugano in 1873, is one of the largest banks in Switzerland and the oldest in Canton Ticino, which since the 2000 has started an important collection of contemporary art, with artists such as Tony Cragg, Mario Merz, Giulio Paolini, Alighiero Boetti, Fausto Melotti, Franz Ackermann, Alberto Garutti, John Armleder. The collection is enjoyed by the bank employees and customers who have faced a new way of understanding the workplace, for example thanks to the site-specific intervention of the artists Daniel Buren, Robert Barry, John Armleder and Liam Gillick and the selection of works with which the various bank offices are arranged, in a virtuous approach to art. Other works are exhibited and loaned to internationally recognized museums and exhibition, of which BSI supports the activities, also on the Italian territory. A 360-degree commitment that also takes care of the needs and desires of its customers through an art advisory service. We have spoken about with Francesca Martinoli, Head of Art Management at BSI. Alessandra Ghinato: How was the collection born? What are the aims? Francesca Martinoli: «Our art collection has more than 1600 artworks and is made by two important collectionist units born in two different historical moments with divers aims. We have the corpus of “Young Swiss Art” and photographs coming from the ex Gottardo Bank. As the other financial and assurance companies in the Second Postwar, at the end of 60s the Gottardo Bank began an art collection with the aim of exploring and feeding the National artistic scene. The paintings and the sculptures came from galleries of the various linguistic areas of Switzerland. Moreover we are guardian and promoter of an international art collection thanks to the passion of the Group CEO, Alfredo Gysi. The enlargement of this part of the collection was mainly led to set up the bank offices around the world, the last opened is in Como. With the Swiss art collection shown at Palazzo Botta in Lugano we can document 40 years of history of art in our territory, with BSI Art Collection, placed in more than ten offices of BSI Group, we give the attention to the universe of contemporary art that doesn’t know National borders». A.G.: What is the fil rouge of the acquired artworks? Francesca Martinoli: «If we leaf through BSI Art Collection catalogue, we immediately notice the minimalist and conceptual artworks prevail. This tendency needs, in addition to an attentive observation, an extra explanation to completely enjoy the meaning and it is often provocative. It is not always easy to show in a bank. From 2001 the minimal art was in the middle of the attention of the big renovation project of the BSI Palace in Lugano, that guests our offices, living rooms for the clients and the private restaurant of the bank. 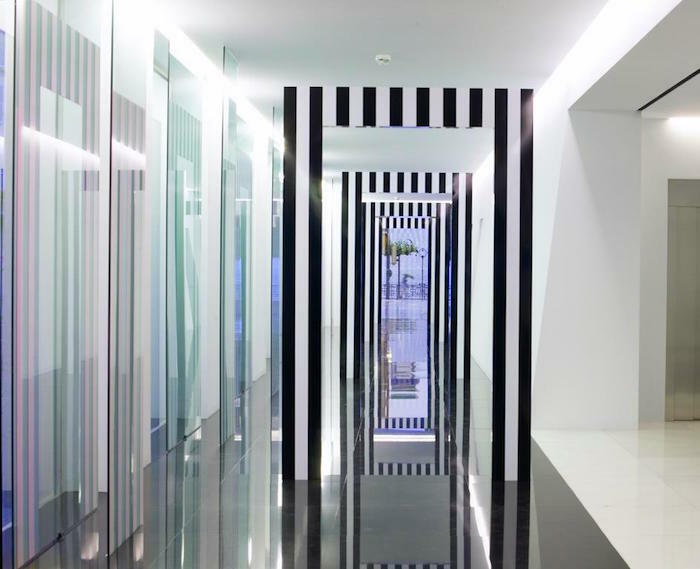 Artists such as Daniel Buren, Robert Barry, John Armleder and Liam Gillick created site-specific artworks, made in relation to the characteristics of the building. Passing from a traditional to a completely changed and radical workplace was a provocation also for my colleagues. They live now with artists who don’t consider their artwork as absolutely independent from the surrounding but as part of a neworks of relations and dialogues with the background». A.G.: Beyond artworks acquisition, what is your envolvement in the art world? Francesca Martinoli: «We invest a lot of energy in improving and preservating our corporate art collection. It makes us believed partern when we work on expansive artistic projects. We also have institutional collaborations with two prestigious institutions in Italy. From 2001 we are Institutional Patron of Peggy Guggenheim Collection in Venice, one of the Italian museum with more visitors. Maybe it is the only one would not need the planning of temporary shows to always have turnout. This year, in strict contact with the department of conservation of the museum, we decided to support two important projects of restoration: a Picasso’s masterpiece and a Pollock’s artwork, acquired by the American heiress, will be submitted to not invasive treatments with nanotechnology. We are curious to get the final result of this operation we could share with our clients interested to art. From 2005 we are sponsor of Swiss Institute in Rome, today the most important cultural center of Switzerland in Italy. It offers educational opportunities for new scientific and artistic talents. The magnificent Villa Maraini, location of the Institute from 1947, guests two years ago the exhibition Allegro Giusto that gave us the chance to put in a new environment and show to a big public more than sixty artworks of our art collection». A.G.: Who decide the acquisitions and the projects? Francesca Martinoli: «We do everything internally and every proposals is always submitted to a scientific committee composed by people with competences and passion for art inside the bank. For the last few years, we have reduced the rhythm of increasing the collection and we have concentrated more in its structure and the fruition. In fact our last offices in Luxembourg, Monaco, Milan and Como are set up with never-exhibited artworks coming from the warehouse». A.G.: Where is the collection exhibited? Francesca Martinoli: «The collection, enjoyed especially by employees and clients, is exhibited for 70% in the representation areas of our offices around the world. A particular attention is given to the headquarter in Lugano. Here we organize exhibition and we are very closed to the new cultural center, LAC (Lugano Arte e Cultura) that from February has guarded for three years three iconic artworks of BSI Art Collection: an igloo of Mario Merz, the spired sculpture Minster of Tony Cragg and a tapestry of the series Alternando da uno a cento e viceversa of Alighiero Boetti. The artworks of the collection are often loaned for temporary exhibitions at important cultural institutions. Recently the itinerant Biennal Manifesta in Zurich shows our painting of the Swiss artist Margrit Jäggli representing the buying manager of Gottardo collection in sophisticated dialogue with the portrait of Julian Opie’s Senior Curator». A.G.: How do you archive the acquired artwork? Francesca Martinoli: «The management of the artistic heritage in BSI is entrusted to people with an historical and artistic education: the archive criteria are museum standard. We are using a database developed by our informatic technicians in the 2008 but we well aware of progress in this sector and we are evaluating new softwares». A.G.: What are your future projects and initiatives? Francesca Martinoli: «At the moment we are in a transition phase because of the change of stockholder so we are manly concentrating on the fruition of the art collection. Furthermore in the integration process with the future stockholder, EFG, we are evaluating different hypothesis for the valorization of the heritage of one of the most prominent company collection of South Alps». A.G.: What suggestions would you give to a young who would like to work in a bank with an art collection as yours? Francesca Martinoli: «I would suggest to enrich the art collection with management or law studies and to give attention to the company goals. It is important to consider the extremities of two collection models: the museum and the private collections. The company art collection is in the middle way». 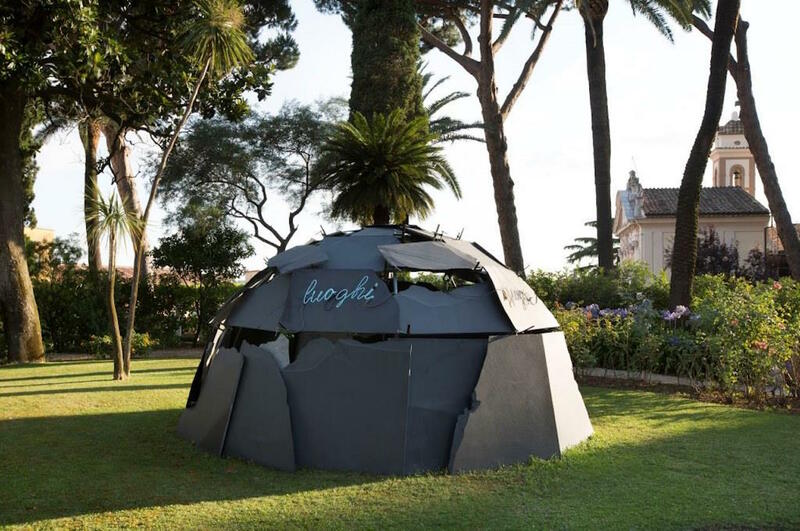 Cover Image: Mario Merz, Senza titolo (Luoghi senza strada), 1994, Struttura metallica, morsetti, lastre di ardesia, neon, Ø 400 × 200 cm circa, foto Agostino Osio.